Two sections make up a complete X-Jets system. The Jet Unit, which is either a jetpack or a jetboard of the different types we make. 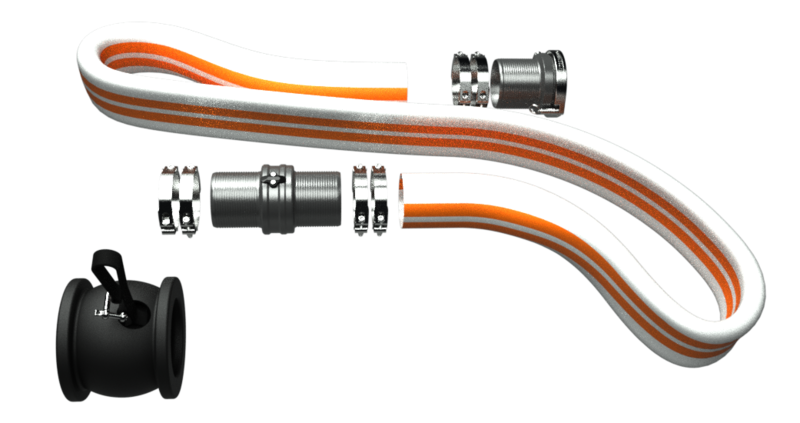 The Power Channel, which is the hose system connected at one end to the jet ski and the other end to the Jet Unit. Select from the checkboxes below to calculate the price of your system and place an order, or schedule a consultation with one of our experts. Use this form to place an order, request a phone consultation, or send us a general information request. Select one of the buttons below to start the process! Thanks for scheduling a hydroflight consultation call. We will be in touch with you within the next 24 hours to confirm the time of our call. Thanks for submitting your information request, we will review your request and get back in touch with you shortly. The Jetblade is designed to be the ideal flying machine. 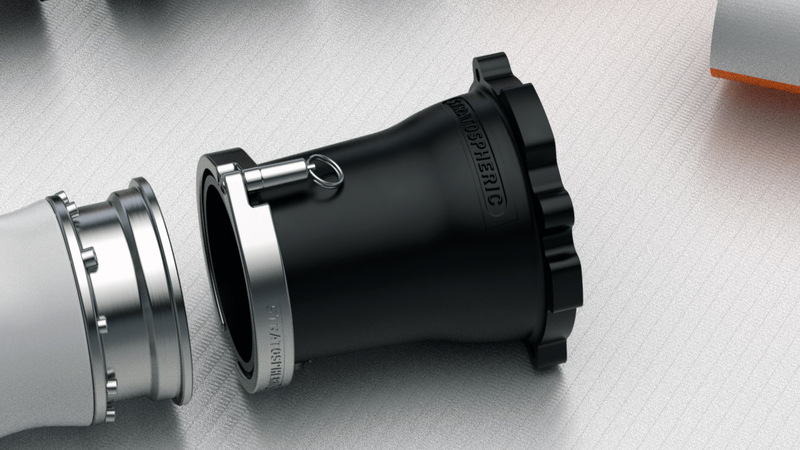 Constructed of marine grade aluminum alloy, computer milled for perfect fit and tolerances. All connections are designed with the harsh environment of the ocean in mind. The Jetblade is hard anodized, then high temp powdercoated to seal the surfaces and keep them looking good for years of use. Independent control of the feet gives you natural balance reactions. Built in flotation pods help you relax when you are idling in the water between flights. 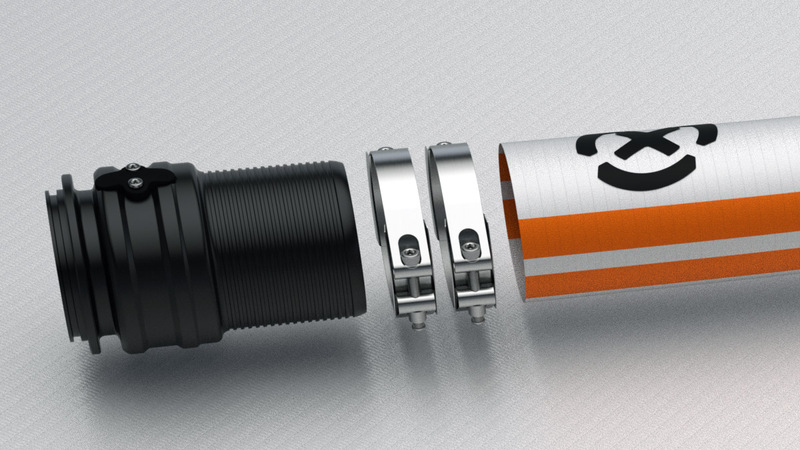 The Big Pin Speed Clamp connects and disconnects from the hose in a jiffy, always a clear clean connection. Self cleaning bearings and super easy maintenance keep you flying without fail. Note: This is the pictured Jetblade unit only, does not include a hose system, which is required for operation. 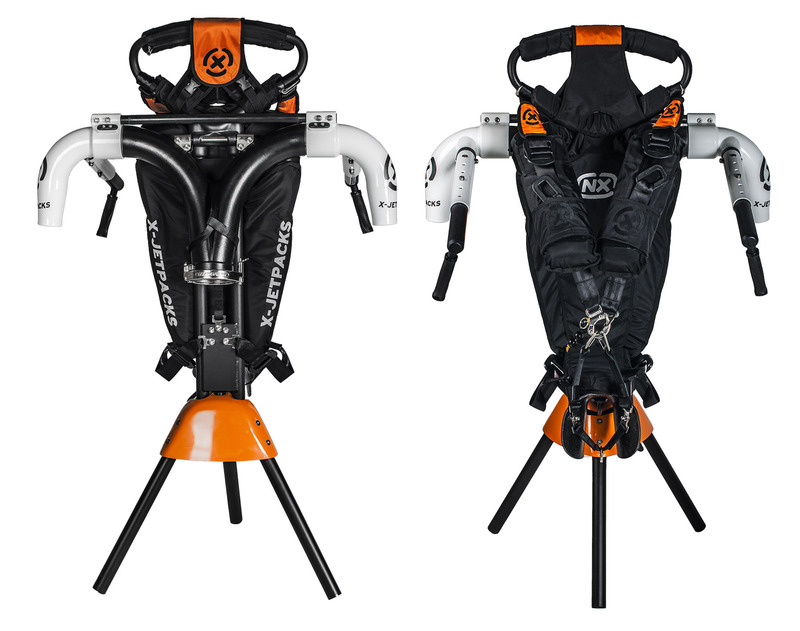 The Jetpack NX is the upgraded sport hydroflight jetpack. Dependable construction, proven in rental locations around the world for the past five years. Full alloy construction and a saddle based harness retained design. Welded alloy airframe with forged alloy axle housing for flight you can trust. Padded built in flotation "vest" directs you face up in the water between flights. Friction free steering allow you fingertip control of steering. The Scorpion Jetblade is the ultimate in hydroflight jetboards. 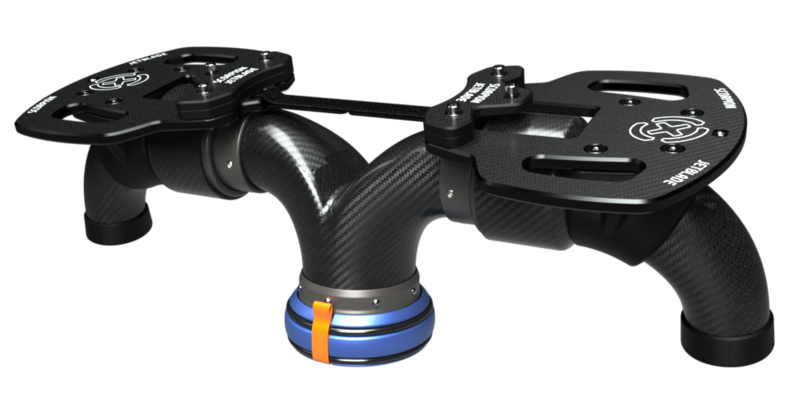 Ultra lightweight carbon fiber construction gives a fast response and CNC bearing races give smooth precision resistance free turning. The Scorpion weighs less than five kilograms, the lightest board on the market! Carbon Fiber Baseplates 10mm thick, CNC cut. The Falcon is a revolution in hydroflight jetpacks. Full Carbon fiber ultra compact frame and a close fitting body harness removes all of the pressure points of a seat. The lightweight but stiff carbon fiber blends the Falcon with the pilot into a seamless unit. The Falcon take hydroflight jetpacks to a complete new level of performance. Hydroflight and hydrosport power system for conversion of a personal watercraft, aka jet ski, into a water thrust powered flight platform. The most technically advanced water thrust system in the sport. X offers several different configuration to meet your performance needs. 20 Meter Daytona hose 110mm diameter, Dual 180 U pipe redirect with CNC aluminum and 316 stainless steel flanges, full 316 stainless clamps and hardware, jet ski adapter, tension sleeve, all you need to turn your jet ski into a hydroflight platform! Hydroflight and hydrosport power system for conversion of a personal watercraft, aka jet ski, into a water thrust powered flight platform. The most technically advanced water thrust system in the sport. X offers several different configuration to meet your performance needs. CNC billet, sealed bearing, largest diameter throat jet ski nose swivel with big bell bumper and nose cord. 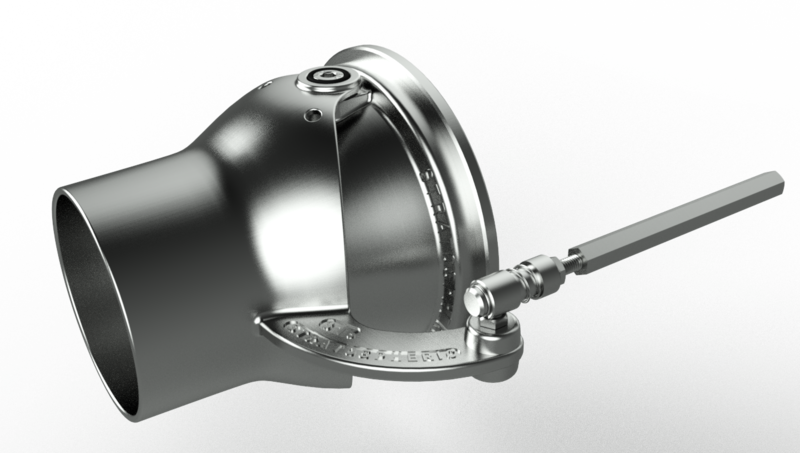 X-Jets Custom, full 316 stainless, performance steering nozzle. Thanks for submitting your order request! We will be in touch with you shortly with the final invoice amount including express shipping and full payment details. Thanks for your consultation scheduling request, we have experts available to speak with you in the US and in Shanghai. Based on your time zone we'll select the right person and be in touch shortly. We have dealers and partners located around the world. If you are located near a dealer we will transfer your information directly to them for best service. We sell and ship globally to all other destinations. Include your information in the form and we will determine the best method for you. Shipping is either by Federal Express or DHL. Shipping times are express, and ship within two days of receiving payment in our account. Shipping times vary world-wide between two to ten days. Shipping rates vary according to a variety of factors, please contact us and we will determine the most economical method available. The best experience with hydroflight begins with proper training. We have certified trainers around the world and can recommend the best options for you. Trainers can also travel to your location depending on your requirements. Payment is via bank transfer to the HSBC bank located in Hong Kong. We accept multiple currencies, all prices on the X-Jets website are in USD. Products are warrantied for personal use for one year with the exception of hoses. Hoses have a six month warranty. For commercial use, products are warrantied for one year, with the exception of a three month warranty for hoses. 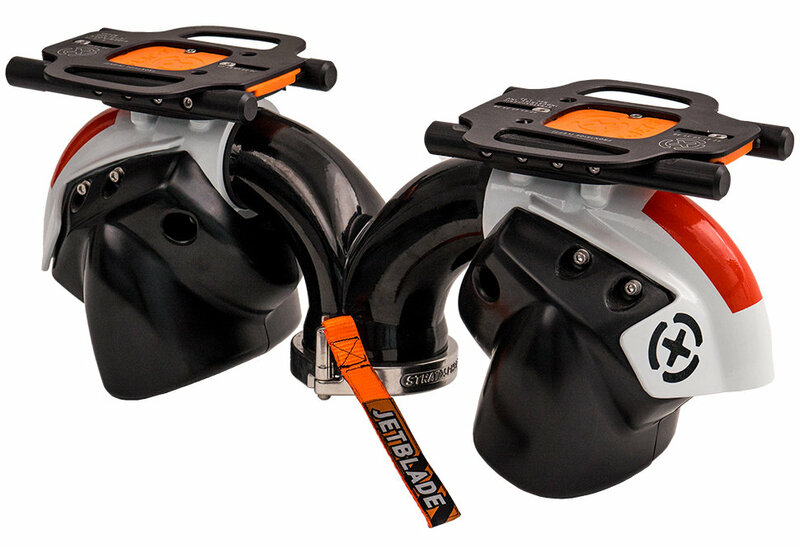 Items on the Jetblade with extended lifetime warranty are the Y pipe and nozzles. More information can be found here. Warning: Operation of any open water, petrol powered craft and/or “extreme sport” or “thrill sport” equipment such as the X-Jets Jetblade or X-Jetpack, can expose users to danger even when practiced under the optimum circumstances. Operator error of either the jetboard pilot ( “pilot” ) or the operator of the watercraft powerplant ( “throttleman” ), jetboard component failure, watercraft component failure, adverse environmental conditions above or below the water, or simply pure bad luck can result in serious injury or even the possibility of death. Every person purchasing or using an X-Jetpack or Jetblade, either directly or indirectly from Stratospheric Industries, Inc, is strongly forewarned, that the operation of the device poses different risks from the use of other water based recreation craft. The purchaser or user of these devices must ensure that the device is fully inspected upon delivery and before each and every following use. The owners must follow the manufacturers service recommendations and maintain the hydro jet flight system in safe working order. Likewise, the purchaser must ensure that the operators, both pilot and throttleman, and all other users, are in adequate physical and mental health to use the jet device safely. The users must be able to swim and comfortable in open water, the area of usage must not be so remote as to hinder timely rescue or first aid. The user must wear a regulation personal flotation device and the pilot is strongly advised to wear a protective helmet. The users must also insure that the area of operation, weather conditions, density of water traffic, swimmers, or other spectators, and all other contributing factors are suitable for safely operating the device. Stratospheric Industries, Inc, can offer operation guidance and usage advice, but the final responsibility for the use of the device rests solely with the purchaser or other user who operates the device at his or her own risk. This device operates only in tandem with two people. The operator on the watercraft (“throttleman”) has control of the engine throttle and operates the hydro jetboard in conjunction with the pilot. The throttleman is responsible for the safety and well being of the pilot on the jetboard as well as surveying the surrounding conditions. The throttleman has the ability to safely lower the pilot to the water level if any condition or situation requires it. Both users must familiarize themselves with the operating instructions. 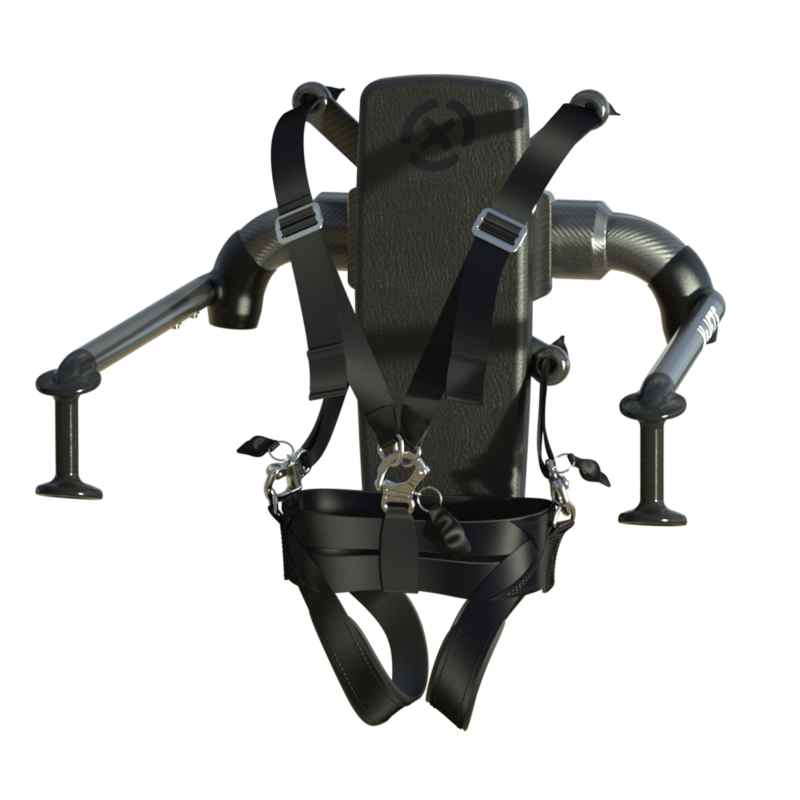 In designing and manufacturing the X-Jetpack and Jetblade, Stratospheric Industries, Inc’s has striven to create an exhilarating but safe activity. However, the use of any such a thrill device is inherently a high risk activity which may cause or result in serious injury or death. By purchasing the device, you have accepted the risks that are inherent in flight and operation of the equipment. You may reduce (but not completely eliminate) the risk by following the procedures set forth in the X-Jetpack Operation Guide, and by following the basic safety requirements. IF YOU WISH TO COMPLETELY AVOID THESE RISKS, DO NOT BUY, DO NOT FLY AN X-JETS HYDRO FLIGHT SYSTEM. PURCHASER HEREBY EXPRESSLY ACKNOWLEDGES THAT THE USE OF THE X-JETPACK OR JETBLADE INVOLVES RISK WHICH MAY CAUSE OR RESULT IN PROPERTY DAMAGE, SERIOUS INJURY, OR DEATH, EVEN WHEN USING PROPERLY FUNCTIONING EQUIPMENT. We prefer that you have experience with X-Jets products before moving into a dealer position. Contact us at info@x-jetpacks.com for dealer possibilities in your part of the world.